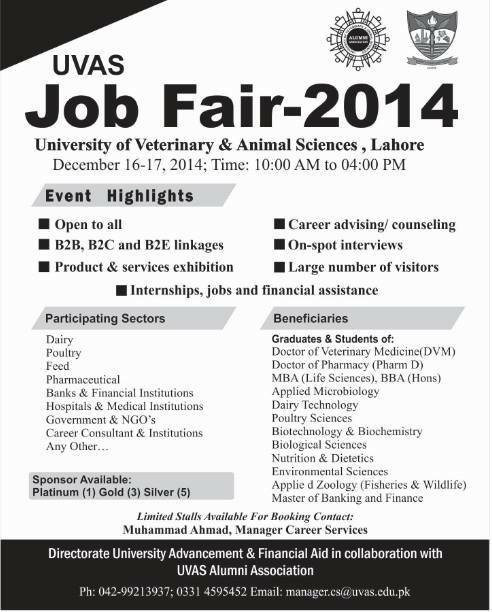 University of Veterinary & Animal Sciences, Lahore ((UVAS, Lhr) is organizing a job fair in December 2014. This is the 3rd annual job fair organized by UVAS, Lahore for graduates and post-graduate students of animal sciences, poultry sciences, zoology and other studies related to livestock sector of Pakistan. The main purpose of this annual job fair is to create a bridge between graduates and different national and multinational companies. More than 200 companies are arranging their stalls for better communication with graduates searching for jobs. Livestock sector of Pakistan is growing and flourishing rapidly. Pakistan is one of the top milk producers in the world after United States, India and China. Poultry sector is becoming the best businesses and have it’s own part in economy of Pakistan. According to economic survey of Pakistan 2013-2014, poultry meat contributes 28.0% of the total meat production in the country. Poultry Industry is more than Rs. 200.00 billion. Poultry sector has shown a robust growth @ 8-10 percent annually which reflects its inherent potential. 12. Saami Pharmaceuticals Pvt. 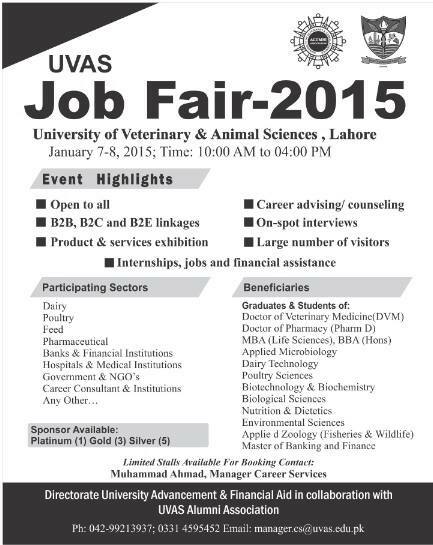 Ltd.
UVAS, Lahore is looking for maximum undergraduate students and graduate to visit this fair. If you are looking for jobs in livestock sector and if you have plan to start your professional career with some good business tycoons then we would suggest you to not miss this year’s UVAS Job Fair. And don’t forget to bring your resume along. 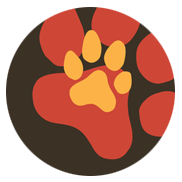 Update December 5, 2014: The managing team University of Veterinary and Animal Sciences, Lahore has changed the dates of Job Fair and now it will be happening in January 2015, so now recall it as “Job Fair 2015”. Here is the official poster release by UVAS, Lahore.